Tania Chandler’s debut Please Don’t Leave Me Here, did not feel like the start of a series. That story (reviewed here) explored the life of Brigette, married to Sam, the policeman who many years before investigated the death of a music promoter that she had been having a relationship with. While it had crime stylings, Please Don’t Leave Me Here was more of a character study of Brigette as she tried not descend back into drug abuse, with second half of the novel focussing on the shady past that she was trying to leave behind. So it was surprising, but not unwelcome, to find Brigette as the centre of Chandler’s second novel Dead in the Water. A quick search of the Internet reveals that Dead in the Water is a very popular name for some decidedly B-grade crime fiction. But this aspect of the novel turns out to be a bit of a meta-commentary on crime fiction. 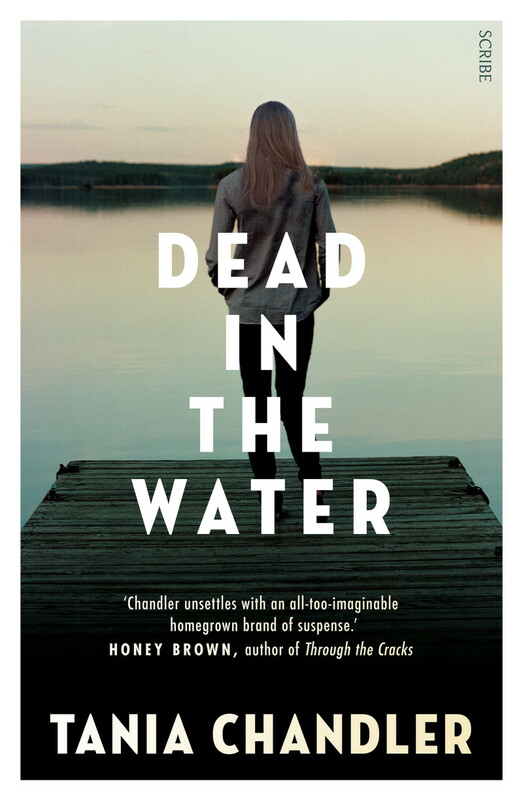 Dead in the Water is also the title of a crime novel within this novel, in which a hard-bitten, hard drinking detective has to investigate the murder of his wife. The novel in the novel is the fourth of a series of procedurals written by an old flame of Brigette’s who comes back onto the scene throwing more disturbance into her already rocky second marriage to policeman Aidan. A celebrity chef has been found dead and there are some echoes of the plot of the novel Dead in the Water. Brigette is possibly in danger but whether she is actually a target is unclear. Despite this, her husband becomes increasingly paranoid and erratic. Once again, while this has some thriller styling, Dead in the Water works better as a character study of Brigette and, to some extent, her cop husband Aidan. Both are still suffering from events in their past, both have issues that they can’t get past and both are failing to deal with them so that they are starting to drift apart. Dead in the Water shows Chandler’s development as a crime writer and as a novelist. Brigette’s past, rather than being dealt with directly, is handled well in very brief flashbacks and memories. The crime, once again, is being investigated and solved off the page but even so, the plot builds to a tense finale. And while the use of the novel within the novel with similarities to what is happening in real life is a little hackneyed, Chandler does not overplay this aspect, and uses it effectively to build the creepiness. As before, Chandler ensures that the soundtrack is never far from the surface, adding to the atmosphere of many of the scenes. In an age of throwaway domestic thrillers with the word “Girl” in the title, Dead in the Water shows the breadth of the Australian crime fiction scene. It demonstrates a willingness to explore a real characters dealing with real trauma, even in the slightly heightened reality of the crime genre. While it might be stretching the friendship for Brigette to realistically star in many more crime novels, it will be interesting to see where Tania Chandler goes next.